Critical Thinking Should Your House Be Coming Soon? It’s all the rage… the “coming soon” sign on the front lawn. Two of my clients have asked me to put one on their lawn this year while they were preparing their homes to sell. Why did they ask me? The first reason is my fault – I forgot to talk to them about this fad when we were working on the marketing plan for their house. I hadn’t really thought about clients bringing it up. But the reasons they had in mind were different in each case. The first one thought it would be a good idea because there was another house for sale a few doors down. Why not let potential buyers know that another option is coming soon? The second client saw a house on her street with a “coming soon” sign, and the house seemed to sell really fast. 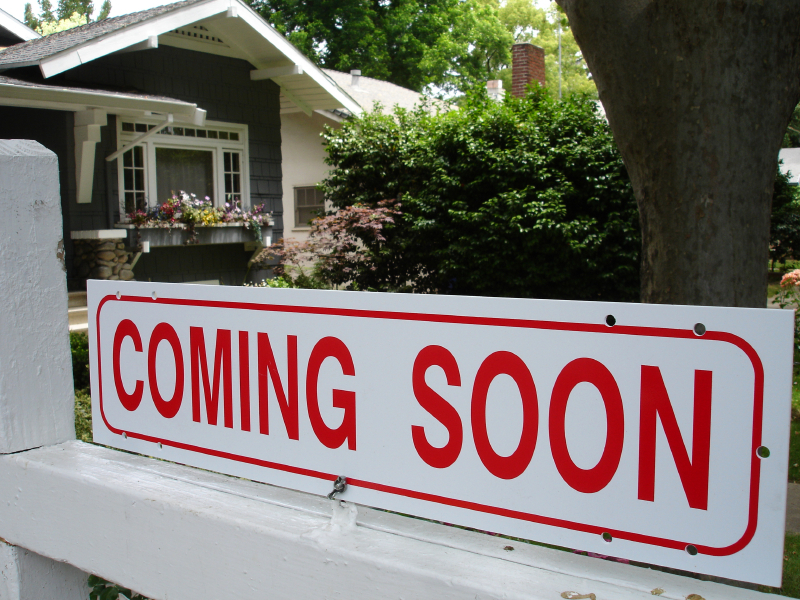 If you’re thinking about selling your house, maybe you think you should have a “coming soon” sign on your lawn. Let’s look at this from a few angles. First, imagine you’re looking to buy a house in the area where my first client lives. Your agent books a showing for you on the one house that is for sale down the street. You look at that house and while you’re there, you notice a “coming soon” sign on my client’s house a few doors down. What do you do? Do you go knock on the door or have your agent call me to find out if you can see it today? Well – my clients are working on getting it ready to sell; if it was ready, it wouldn’t be coming soon, it would be for sale, right? Chances are, if they are working on getting it ready, we don’t want you to see it yet. You might be thinking – yah, but if my clients let you see it now and you like it better than the one that is for sale, you might buy it now and they can stop working on getting it ready. But if it isn’t ready, what’s the chance you’re going to like it better than the other one? Perhaps you feel that if it has a better layout you will prefer it to the other house – maybe my clients are just putting finishing touches on it but it’s good enough that you can see that you like it. Experience shows that finishing touches make a world of difference in the impression buyers have of your house. Buyers pay more for homes that are fully prepared and staged and beautifully presented. If you like my client’s house better than the other house, but it isn’t fully prepared, you are going to value it less than you will once it’s ready. If my clients sell it to you now, you will negotiate a lower price than you will once it’s perfect. More importantly, if the house is so nice despite not being quite ready to show, that you are ready to pounce on it, what does this say about how it is going to be received by the market once it is ready? What will happen when we expose it to all 2,000 people who are likely to buy a home this month in Ottawa? Chances are at least one other buyer is going to love it too, and each buyer will feel the pressure of potentially losing the home if they don’t offer a good price for it. We might even field competing offers. Agents who want to place a “coming soon” sign on your lawn might tell you that the sign will generate interest ahead of time, build anticipation, and generate competition once the house is ready. But will that really happen? Where is this agent going to promote the house while it is “coming soon”? How much exposure is it going to get? It won’t be on Realtor.ca where millions of people each month look at homes in Canada. Where 95% or more of the home buyers shop and select the homes they want to visit and potentially buy. Where even the unrepresented Sellers publish their homes these days. Where will it be advertised? On the agent’s site? This site (OttawaAgent.ca) gets between 100 and 500 visitors a day. Few agents have sites that would do much better. Most of the visits are not people looking at listings of homes that are not for sale yet. The agent may advertise the house within his own Brokerage – presumably without photos and not allowing showings until it is ready to hit the market. from a buyer who happens to drive by or in the rarest of cases see the home without photos on the agent’s website. The buyer calls your agent and arranges to see the home and buy it before it hits the market. Nice fast sale. Great double commission for the agent (sure, he may lower the total commission because he is bringing the buyer, but…) Definitely a lower price than you could have received if the house was exposed to all potential buyers. from a buyer who is a client of the agent or her Brokerage who is given advanced knowledge of exclusively listed and coming soon homes as a service. In this situation, the agent and the Brokerage that you hired to represent your best interest and get you the best results, are giving preferential treatment to their buyer client, allowing them to get a good deal on your house before it is exposed to the wider market. There are no valid arguments in favour of a “coming soon” sign on your lawn. If your house is a hot commodity, you absolutely want to make sure you expose it to every buyer who might be interested. And you very likely would benefit from a little lead time before considering offers. But for that strategy to work, those potential buyers all need a chance to see your house before you consider offers. The only way you’re going to reach all of the potential buyers is to put your complete marketing plan in place. Get your home on the MLS system, which feeds Realtor.ca and myriad syndication sites. Postpone the consideration of offers for a period of time to allow active buyers the opportunity to see it. Consult with your Realtor about the length of time to wait based on the absorption rate of listings in your immediate area, current competition, and your pricing strategy. If a Realtor you are interviewing recommends a “Coming Soon” sign before actively marketing the home, ask them exactly how it will play out in the event someone is interested in your home before it hits the market. Ask them who will be exposed to the property before mass marketing, and how that will happen. If it sounds like the Buyer or the Realtor is the chief benefactor, you may want to interview other Realtors as well, to find one who will put your interests first.